Last weekend Betty and I motored down to Elmore and Owyhee Counties, Idaho, for a day of looking around at the snow (what remained), the birds, and the Columbia Basin landscape. The southwestern part of Idaho, upon initial encounters, appears to be harsh, ugly, boring and a lot of other pejorative adjectives, but in each season the sage brush plains and craggy mountains deliver up singular delights. One of our favorite times to get out into the region is the winter. Not to detract from both spring and fall, which deliver their own spectacular moments, the winter light that reaches low out of the southern sky casts a nostalgic glow on the snow and the land and the things that dwell in the harsh environment. We stopped at Ted Trueblood Wildlife Management Area just north of Grandview and took a little saunter among the cattails and Russian olives. The song of Canada geese carried along on the breeze. We looked for owls but found none. A female belted kingfisher flew above us and stuttered its angry warnings, then flew off to kite like a kestrel over a slice of open water in an otherwise frozen pond. In the distance, the Owyhee Mountains jutted up from the flat horizon. 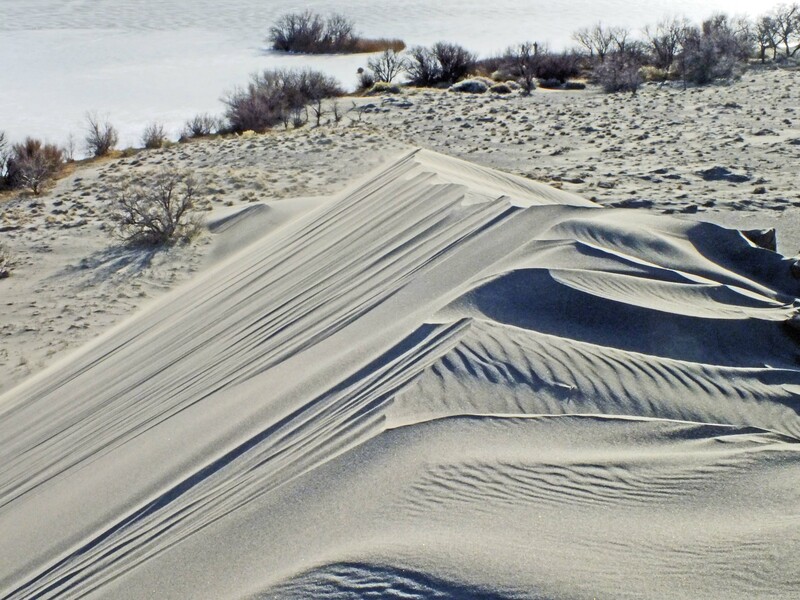 We traveled on to Bruneau Dunes and climbed to the spine of one of the big sandbanks. The gray sand was damp and frozen on the west side and dry and fine on the east. The ever present winds scaled over the rim of the dune and scattered a veil of sand off towards Wyoming. Down below, the small lakes were frozen with huge gaggles of Canada geese walking on the ice, cackling to each other, or who knows, maybe to us. 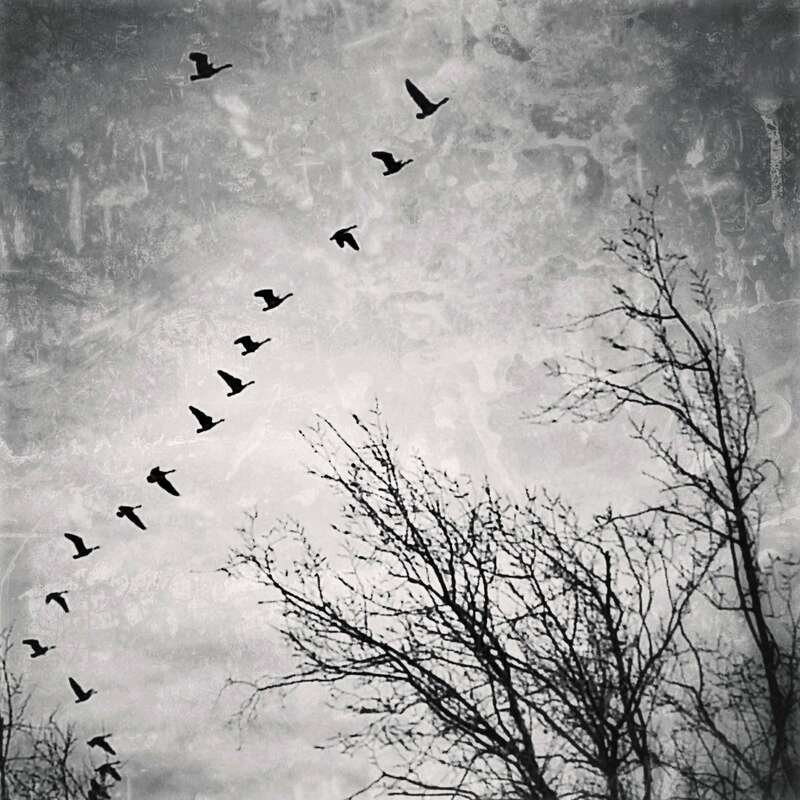 Occasionally a dozen or so would rise with an alarmed riff of squawks and fly off to some undistinguishable destination, maybe grain stubble over towards Mountain Home or a fallow hay field along the highway to Hammett. We traversed the spine of the dune, fighting to keep our balance as we stepped into a frozen spot that made us slip or a thawed place that acted like there was some not-so-benign intelligence down there intent on sucking us down. Down. Often, when I talk about Idaho to folks domiciled in other locations, they think the state is all like the mighty Tetons or the photogenic Sawtooths, not a land of sage and sand. But like much of the American West, Idaho is a variety. Forested, mountainous, desert, swamp, lake and stream and river…and sand. This makes me think of the sand in the southwest, the dunes outside of Yuma, Arizona, and the several dunes around my old home town. There was one dune in particular, on the Tohono O’odham Nation between my town, Casa Grande, and the Mexican border. Tohono O’odham means “desert people” or something close to that and is an apt description of the folks that live on the vast nation (or reservation), the second largest in the 48 states. When I was a kid growing up, we called them Papago Indians. Papago, I believe, comes from a Spanish language distortion of the Tohono O’odham word for “bean people.” I think the “beans” referred to in that moniker are probably mesquite beans which the Tohono O’odham people utilized in the form of flour, porridge, cake and drinks. Mesquite, along with palo verde and ironwood, are the dominant trees of the Sonoran Desert and are members of the pea family. They nitrify the soil, provide beans that feed mourning dove and Gambel’s quail, desert big horn sheep, coyotes, wolves, rabbits, desert pronghorns and the indigenous people of the desert. Mesquite also makes excellent coals for cooking. The particular dune I am writing about is positioned in what we local Anglos called White Horse Pass south of the Tohono O’odham village of Chuichu. White Horse Pass sits in among the Silver Reef Mountains and when I was a kid and a young man, it was a stop on the way further south to Arizona’s own version of the Sawtooth Mountains. We used to rattle down the dirt tracks into those rugged granitic fingers and points and teeth in search of agate to cut and polish and to make into jewelry. I relished the hunting and the finding of the raw agate and the bothering of the old core drillers who used to sleep on cots in the open air next to their well rigs as they prospected for gold and silver. Now the area is designated as part of the BLM-managed Ironwood National Monument. Some of the roughest country I have ever traversed on foot lies at the foot of Baboquivari Peak. Jaguars have been sighted there and in the fall, winter and spring it is a great place to visit if you want to climb rugged cap rock and hunt mule deer and quail among the spikey slopes loaded with ocotillo and prickly pear. And when I say hunt, I don’t necessarily mean with a weapon. You might have a camera, a set of binoculars, or both. The Sonoran Desert in Arizona is part of the larger basin and range terrain that makes up much of the intermountain west where jutting, rugged mountain ranges rear off the desert floor with relatively narrow valleys in between; the Baboquivari Mountains and Picacho Peak and Newman Peak and the Sierra Estrellas and San Tan Mountains and the Vekol Mountains and the Silver Reefs and the Silver Bells and the Tucson Mountains where the movie site, Old Tucson, sits evoking memories of John Wayne shooting Christopher George in El Dorado. Moving east toward New Mexico the terrain lifts into the higher ranges, the Santa Ritas and the Santa Catalinas, the Galiuros and the Rincons, the Dragoons, the Pinaleños and the Chiricahuas. When I was younger, besides rolling in the sand of the dunes at White Horse Pass or hunting agate in the Sawtooths, I hunted quail on the valley flats and if I was lucky to find a place where gone-by mesquite trees rotted in the ground, I’d wait until a wet spell in the weather and then take a four-wheel-drive truck and rip the roots of the dead mesquites right out of the ground with a big chain. We’d split the wood with sledge and wedge and maul and ax and load it into our pickups and haul it home to use in our homemade grills to cook lamb chops and prime rib and chicken. How I loved the sounds of those tools, the clink and clank, the chunk and later the hiss and sizzle of meat over red-orange coals. When taking breaks from splitting into the red heart of hard mesquite, we could watch the drug runners in their Beach Barons and Cessna 172s flying low down the valleys from Mexico to deliver their loads of marijuana to the Phoenix area. Now the BLM warns you about going into the country south of White Horse Pass because of the migration of aliens out of Mexico. I suspect the folks from Mexico and El Salvador and Honduras who want to work are not the big problem, but the men who “manage” the migration; those coyotes are what should be avoided. Having lived in the desert for over thirty years, many times I ran into aliens (sans their managing coyotes) going north for work. Never once did I feel threatened. Soon we will be down in that Sonoran Desert country screening our film and photographing saguaro cacti and adobe walls and looking at the Silver Reefs and Baboquivari. 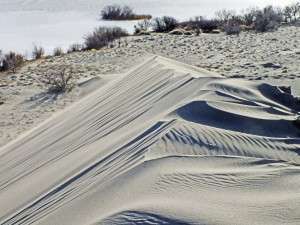 It will be fun to compare and contrast the sands from White Horse Pass with the sands of Bruneau Dunes.